The modern truck transportation market is represented by an extensive number of offers, moreover, to maximize the automation of service delivery, it is important to optimize work processes, provide customers with the most favorable conditions and increase competitiveness. 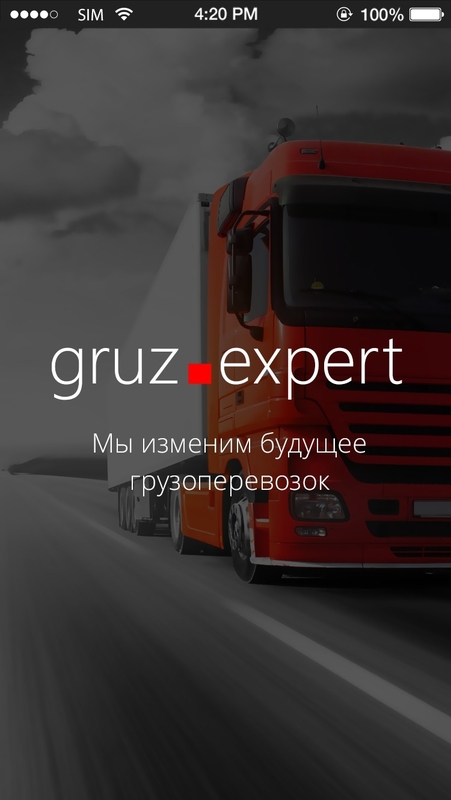 Gruz.Expert - mobile application for truck transportation, which allows you to make this business effective at 100%! The program is suitable for use on devices with the operating system Android and combines a convenient interface, rich functionality, accuracy in operation and ease of use. Customers of corporate truck transportation. Both carriers and their customers can use the software to control loading and unloading processes, transportation itself, receive reports from each stage, and ensure transparency of civil law relations. If the main area of your activity is truck transportation, the application on the phone will allow you to remotely monitor work performance, detect downtime, provide a rational load for employees and guarantee the quality of services. Authorization of any user regardless of his status is carried out using the taxpayer identification number, which is not only convenient but also provides a high level of security. The administrator creates a user account, assigning it as a broker or dispatcher; if the organization is the customer, the status is automatically identified as a broker. In the process, a working e-mail indicates, which e-mail will be used for sending of the confirmation e-mails, the main user information (name, contact details, etc. ), and a password for the new account is assigned by an administrator. After completing registration, the user must click on the confirmation link to receive an e-mail. All information when placing an order, information about the placement, are sent to the server; if there are communication problems, the server is unavailable, the information is stored in the memory of mobile devices and sent to the cloud storage when the connection is restored. The frequency of data transmission - every 5 minutes: thanks to this, users can access the latest information about the state of vehicles. Automatic start of the program when the device is started. Notifications of failures of the transfer of coordinates or the determination of places. Ability to use several modes: navigation (determination of the place of departure-arrival) or tracking on the map with capture on three points (point of loading, unloading, vehicle). When working with a map, you can change the scaling, switch to a chart or map from a satellite. The option of an online chat with the dispatcher or customer. A call is made at any convenient time or a schedule is assigned for an automatic call. Confirmation of arrival at the loading or unloading point: the application determines the vehicle by satellite and offers a confirmation of arrival by clicking on the corresponding button. 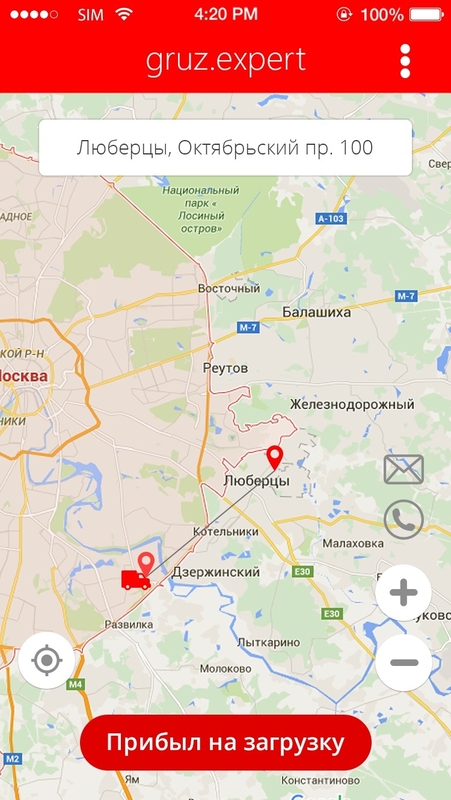 Documentary recording of the fact of idle time of the car with the application of confirmatory pictures. The wide functionality of the application. With the help of this program you can establish control over the personnel, always be in touch with the client, reduce the costs that result from the under-planned work process. The application works on all types of mobile devices with the Android system installed (version 4 or higher) on the tablet, mobile phone, laptop and other devices: only access to the Internet network is necessary for the transfer of actual data and communication with partners and customers. The application for transport Gruz.Expert has an adaptive design, which is conveniently displayed on any device without loss of functionality, it is easy to load and has a friendly interface. On the page, you can see the screenshots of the program and see for yourself personally. The high speed of information processing: the program promptly loads, receives and sends data, and thanks to regular updating you will receive actual data on the condition of the cargo, the location of the vehicle, learn about the fact of the idle time of equipment, etc. The ability to automate the most basic processes from the distribution of tasks and ending with mutual settlements with the client. Thanks to this you will be spared from a significant load. Convenient route construction, the ability to choose the best option and control the movement of the vehicle strictly at the given coordinates. You will be relieved of the problems associated with the insufficient discipline of the staff: any unplanned movements, delays, deviations from the route will be fixed and communicated automatically. Reducing the cost of business processes. You can optimize all the work tasks associated with the organization of transportation, reduce the number of downtime due to the fault of unorganized work, and always know how many orders you have in processing, how many tasks you can solve without compromising the quality of the services provided. Development of the application is a multi-stage process, which is carried out by a whole team of high-profile professionals. In our company, each direction is entrusted to professionals who work together, and their actions are strictly coordinated by the manager. Project managers responsible for the organization, contacts with customers, controlling the reconciliation processes, proper development, additions, etc. Designers: responsible for the appearance, interface of the application, making it as attractive, visually understandable and simple. Programmers who create code are the basis of the program, without which it will not exist. A content manager that is responsible for the text and graphics content. System administrators who configure and debug the application, as well as responsible for the technical component in the preparation of the project. Quality assurance engineer checks the program for malfunctions, defects in start-up and operation, responsible for the smooth and efficient operation of the software. Development of the draft program, the formation of requirements, functionality, the collection of wishes for design and opportunities. Writing a working code with comments. Testing the program, preliminary approval. Placement of the app on the Google Play Marketplace. The timing of the development of a standard solution can vary: they are affected by the promptness of obtaining a full technical assignment, the organization of individual processes and the coordination of results. Using the service Gruz.Expert allows you to increase the efficiency of your business, debug most of the work processes and make the freight as fast, accurate and convenient. If you need a similar software solution for freight services, please contact our company, where the development is handled by professionals!